Install PEAR in Windows Vista or Windows Server 2008 | Out of the box. 2. 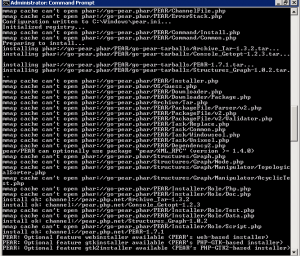 Go to the installed PHP 5 directory, then type to activate batch command in the command prompt “go-pear.bat”. 3. Choose to install PEAR system wide, by default system install is selected. Press enter to proceed. 4. Next Question wizard will proceed to prompt you for path, use default will be fine, unless you has customized your PHP installation. 7. Once files is copied over and installation finishes it will prompt “Thanks for using go-pear !” . Then go back to the PHP main path and type “pear version” for post installation testing. 8. Post installation does not requires to run or tweak registry or running PEAR_ENV.reg is not needed. This entry was posted in Information Technology, PHP and tagged PEAR, PHP, PHP 5, PHP5, Windows Server 2008, Windows Vista by KarMeng. Bookmark the permalink.